TS D.Ed 1st and 2nd Year Practical Exams Hall Tickets for FLTP Final Lessons Teaching Practice 2019: TS D.El.Ed 1st and 2nd year Practical Exams Hall Tickets 2019, TS D.Ed 1st and 2nd year Practical exams hall tickets, Telangana D.Ed I and II year Final lessons Practical Exams hall tickets 2019, TS D.Ed First and Second year FLTP Final Lessons Practical Exams hall tickets. BSE Telangana, D.El.Ed. Course 1st year and 2nd year Final Lessons Teaching Practice Exams 2019 Hall Tickets are Released, download from official website. The TS D.El.Ed 1st year and 2nd year practical examination 2019 hall tickets have been released by the Directorate of Government Examination, Telangana. Candidates can download the admit cards from the official website bse.telangana.gov.in or the link provided below. In order to download the Hall Ticket, candidates would require their first-year roll numbers. The examinations for 2 years are scheduled to begin from Marc 1 to 13, 2019. Steps to download the admit card along with the direct link is provided below. It is notified that the Diploma in Elementary Education (D.EI.Ed.) I & II Year FINAL LESSON TEACHING PRACTICALS (FLTP) of 2018-2020 & 2017-2019 batches will be conducted in two spells i.e. from 01-03-2019 to 15-03-2019. The Principals of all private D.EI.Ed colleges in the state are hereby informed to contact the Principal, Government DIET of their concerned district for further information. Candidates are advised to download the admit cards as soon as possible to avoid delay due to technical issues. Also, the students who have failed in the earlier batches are also eligible for the examination as a private candidate. All such students can also download the admit cards/Hall Tickets. Please note, no examinations would be conducted with the old syllabus after this exam. How to download D.El.Ed 1st and 2nd Year Practical Exam Admit Card? : D.El.Ed. 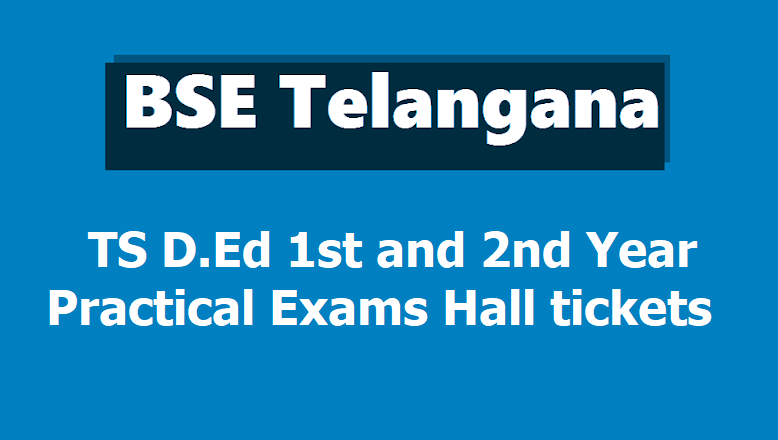 1st and 2nd Year Practical Exam 2019 Hall Tickets have been released by the Directorate of Government Examination, Telangana on its official website - bse.telangana.gov.in. The Directorate of Government Examination, Telangana is scheduled to organize the practical exams for students of 2nd year D.El.Ed. of 2017-2019 Batch and for students of 1st year D.El.Ed. of 2018-2020 Batch in March. Candidates who are eligible to appear for the D.El.Ed 1st year and 2nd Year Practical Exams can follow the instructions below and download their Hall Tickets. First Visit the official website of Directorate of Government Examination, Telangana - https://www.bsetelangana.org/. Click on the D.EL.ED 1st year 2019 Practical Exams Hall tickets OR D.El.Ed 2nd year 2019 Practical Hall tickets hyperlink on the left side of the homepage. Enter your 1st year Roll Number and click on Download. Download your Admit Card and take a printout for further reference. Step 5: Print the admit card/Hall ticket for future reference. All students are advised to note that the practicals are scheduled to start after the end of theory paper on March 1st to 15, 2019. Also, there would be separate question papers for old as well as the new syllabus. Candidates should accordingly check the same during the examination to avoid error or any confusion. Once the practical exams are over, the theory examination will commence from as per the schedule. The question papers for the examination will be set according to the modified syllabus; however, candidates who had failed in the earlier batches can also appear as a private candidate in these exams with old syllabus as a final chance. Separate question papers will be given to candidates based on the old syllabus and modified syllabus. As per the official notification, no further examination will be organized according to the old syllabus of D.El.Ed. There will be a total of 6 papers that will be conducted from 9am to 12 noon.